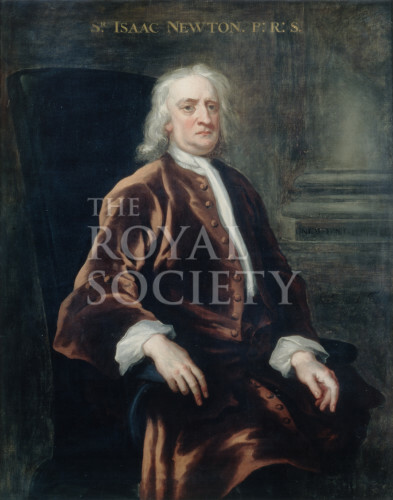 Three-quarter length portrait of Sir Isaac Newton, aged 83 years, seated, with his body half turned from the viewer. Newton is in a high-backed chair wearing an open brown coat, with white neck cloth and shirt cuffs. His hands are at rest, one supported by the chair arm. An architectural pillar is visible to the sitter’s left hand. Inscribed: “SR. ISAAC NEWTON. P:R:S."
Isaac Newton was elected a Fellow of the Royal Society in 1672, he served as its President from 1703 to 1727. The provenance of the picture is discussed in detail by Charles Blacker Vignoles in his letter of presentation to the Society of 25 March 1841. [Royal Society Miscellaneous Correspondence MC/3/150: Charles Blacker Vignoles, 4 Trafalgar Square, 25 March 1841, to the Marquis of Northampton]. This letter was reproduced in Council Minutes for 22 April 1841 [Royal Society Council Minutes, Printed (CMP/1), volume 1, 1832-1836, 11 March 1841 meeting, pp.120-121].